WIN OVERVIEW Washington Interfaith Network (WIN), founded in 1996, is a broad-based, multi-racial, multi-faith, strictly non-partisan, District-wide citizens’ power organization, rooted in local congregations and associations. WIN is committed to training and developing neighborhood leaders, to addressing community issues, and to holding elected and corporate officials accountable in Washington, DC. WIN’s 48 dues-paying members represent 25,000 families in every section of the District and reflect its theological, racial, geographic, and economic diversity. WIN seeks to create long-term power through a broad and united front of organized institutions, organized people, and organized money–acting consistently and persistently for change on multiple issues at the neighborhood, regional, national, and city-wide levels. WIN engages leaders across the divides of race, culture, income, faith, and neighborhood in order to initiate public action on their issues (e.g. affordable housing, public safety, youth, etc.) and to partner with and hold the government and corporate sectors accountable for addressing these issues. Over the past 20 years, WIN has organized to protect over 500 affordable apartments from being torn down or converted to condominiums, has demanded that the District turn over public land to build 172 Nehemiah homes for working families to purchase, and has been responsible for building 305 affordable rental apartments for families and seniors. WIN also organized the historic Neighborhoods First campaign that increased voter turnout in key neighborhoods by as much as 20% and as a result successfully fought for an won $120 Million in neighborhood investment to rebuild libraries, parks, community centers in targeted neighborhoods that were being left behind. Evaluation, assessing what leaders have learned from their experience to help them grow as public leaders and to inform future organizing. Leadership Development & Training, identifying, training, and deploying into action hundreds of DC leaders each year to take action on issues that affect their lives. WIN believes in the Iron Rule: “Never do for others what they can do for themselves, never.” WIN and IAF sponsor leadership training institutes 5-8 times per year, training leaders in the principles of broad-based organizing: how to build power, how to negotiate an effective action agreement to address issues, and how to hold officials accountable for taking action on their promises. Ownership. WIN member organizations and volunteer leaders do the work of WIN—organizing, public negotiation, issue identification, strategy development and ratification. Organizers are teachers. WIN leaders give thousands of volunteer hours per year that produce significant change in DC. They support the organization with membership dues: $100,000 in 2012. Each member institution pays annual dues ($10 for each regularly contributing member; Minimum dues: $1,000 and Maximum dues: $15,000) to support WIN. 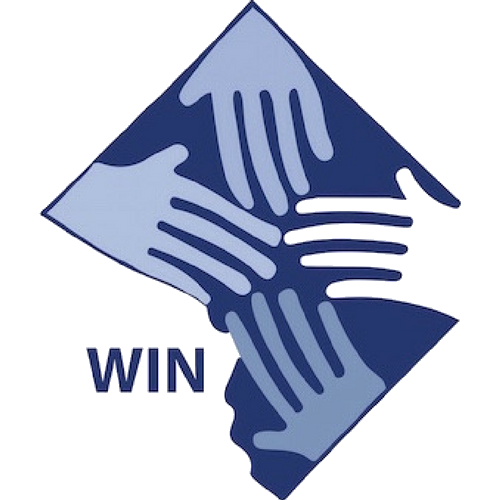 WIN is also supported financially by national and local businesses, foundations, individuals and other grantors who recognize the unique service WIN provides the Washington, DC area. WIN is registered in DC as a not-for-profit corporation and has been designated by the US Internal Revenue Service as a 501(c)(3) organization for income tax purposes. WIN is entirely non-partisan, supports no party or candidate, and accepts no financial support from any level of government for its operations.